All those that love their Grime hard, skippy and forward thinking rejoice! 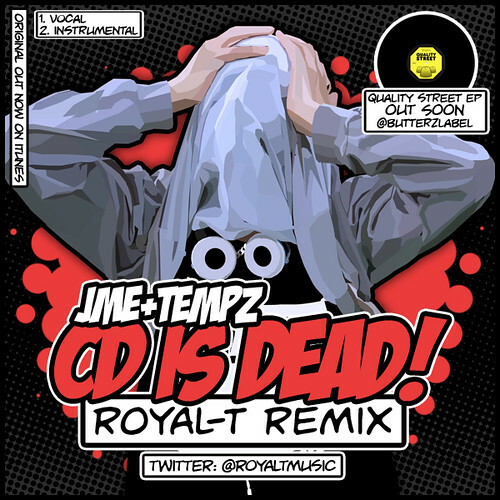 Southampton producer and personal friend of ‘The Fold, Royal T, is giving away his remix of JME & Tempz’ smash, ‘CD is Dead’ here for free. Having been battered by the likes of Elijah & Skilliam in raves for the past couple months or so, Royal-T’s remix is now available for public consumption. The hard snares, stereo keys and raw bass make this one for the iPods as much as the clubs. The download includes the instrumental too, so DJ’s & MC’s that didn’t get it first time round need not feel left out! This entry was posted on August 9, 2010 at 7:19 pm and is filed under Music, Royal T's Beat Blog. You can follow any responses to this entry through the RSS 2.0 feed. You can leave a response, or trackback from your own site. Link is dead, any chance of a re-up?